These dark mages power their spirit magic with the souls of those convicted of crimes. The souls which achieve greatness through their deeds are set free, according to Arthur’s laws. Once their sentence is completed, these souls return to their bodies and live once again as members of their Realm. 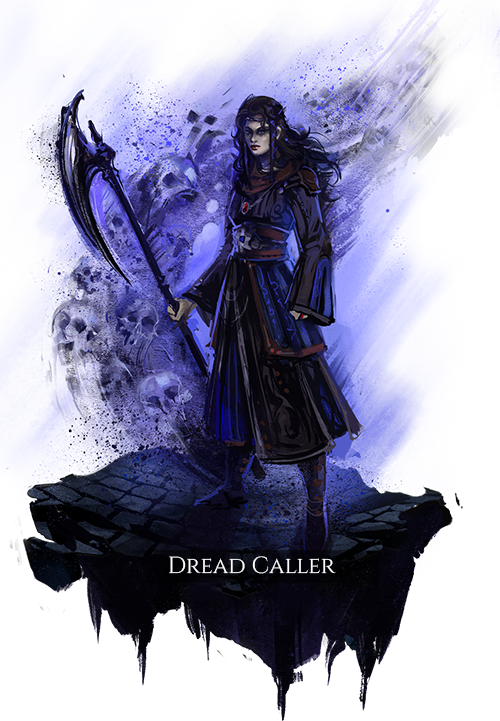 Because the Dread Callers use tainted souls, the spirits that they work with are the darkest of any used in the three Realms. And with their souls, bind them. When the user’s body takes damage, the user’s pet suffers disruption. When the user’s body takes disruption, the user’s pet suffers damage. The power of offensive abilities that are not cast by pets is greatly reduced. When the user’s pets deal damage, the user is healed. When the user’s pets deal disruption, it restores the user’s blood. After the user’s death, the user’s pets continue to live, but begin taking increasing damage over time. The rate of damage over time is reduced as proficiency with each type of pet increases, and can be further modified by additional boons. Calls forth a criminal soul that uses mind and shadow magic abilities to fight for the caster. A hulking protective figure with high health that may travel only a short distance from the user before starting to fade and taking damage over time. Shifts the mind of the caster into the revenant form they have summoned, allowing the user direct control over pet movement and abilities, while their living body remains stationary. When controlling a pet, transfers all of the user’s remaining health to their pet and grants a death buff that increases damage and movement speed, with a duration based on health gained. When not controlling a pet, transfers all of an active pet’s health to the user, and inflicts a spirit debuff that prevents the summoning of pets for a moderate duration. One of each of the user’s known pet types erupts from the user’s body to attack their last target or any other nearby enemy. Pets gain a death buff that directs the healing of Deathly Assistance to themselves.